Yes folks it’s true, women are finally funny! 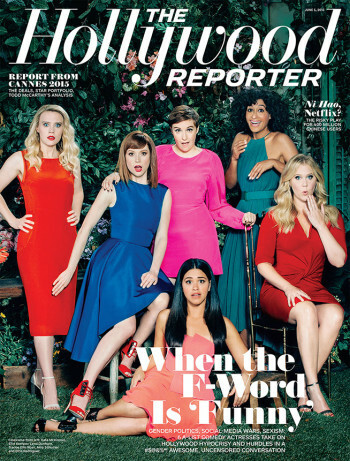 In a roundtable event for The Hollywood Reporter, comedians, writers and actresses Lena Dunham, Amy Schumer, Gina Rodriguez, Ellie Kemper, Tracee Ellis Ross and Kate McKinnon sat down to share their collective experiences and how they managed to rise above the stereotyped sexism that still sadly exists in some areas of the industry. If you thought female comedians aren’t as big of a draw card as males, think again. Five out of the six women in this feature play the lead character in a range of mainstream networks, and some of them are even the writers and creators of said shows. 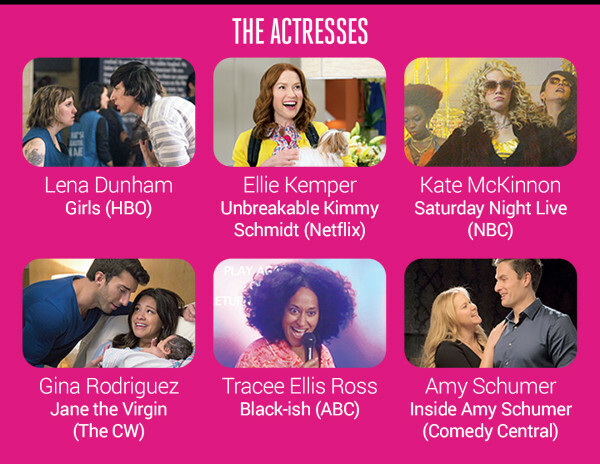 Kate McKinnon is a cast member on SNL, Tracee Ellis Ross (daughter of Diana Ross) is on ABC’s ‘Blackish’, Ellie Kemper plays the lead in Netflix’s ‘Unbreakable Kimmy Schmidt (which we should point out is the brainchild of Tina Fey), Gina Rodriguez is winning hearts and ratings in the Golden Globe-winning show ‘Jane The Virgin’ on the CW (interestingly Gina’s win gave the CW it’s first Golden Globe and first ever nomination), Amy Schumer plays her badass self in her Comedy Central series ‘Inside Amy Schumer’, and Lena Dunham is the star, creator and writer of HBO’s ‘Girls’. Each of these women are examples of the growing diversity that is slowly happening on cable TV, on-demand platforms, network TV and even film. Key Hollywood decision makers are slowly awakening to the fact that women are profitable economic investments in entertainment, as much as men. This diverse and young group are proving women should no longer be relegated to the sidelines or just to playing supporting characters, and often they have proved this by creating their own content (in the case of Lena and Amy) just to shut people up! So it comes as no surprise that the stories about feminism, sexism and being taken seriously in Hollywood somewhat overlap with each of these women. It is the roundtable of our dreams, but now that The Hollywood Reporter did the industry and audiences a favor by getting them together to put to rest all the stereotypes, we don’t have to imagine it any longer. Let’s take a peek into some of our favorite conversation parts. When asked what’s the most sexist thing they have experience in Hollywood, Lena mentions a male actor who forgot his microphone was still on and muttered under his breath that he couldn’t wait to be back on a show where there was a “man at the helm”. Later the same guy walked up to her, the show’s creator and star, and commented on how much she was enjoying the lunch buffet. Wow! All of the women feel strongly about fighting racism and sexism in their shows and are thankful they are in a position now to be able to do so. “There was a lot of dialogue about race when ‘Girls’ started. I’d been thinking so much about representing weirdo, chubby girls and strange half-Jews that I had forgotten that there was an entire world of women being under-served,” said Lena. “It’s a scary thing. I think that’s part of what’s happening around race, too. It’s not just race. It’s socioeconomic,” said Tracee. “I don’t believe it’s an issue of hard-core racism. Lack of being surrounded by a culture. It’s also about what Hollywood finds financially beneficial. So when we show them shows like ‘Jane the Virgin’ and ‘Fresh Off the Boat’…Show them it’s all a good investment. And it’s not about race. When you vilify it, people shut down,” said Gina. The conversation moved to the ongoing issue of women being notably absent from late night TV. Amy Schumer hilariously begins by saying women can’t host late night TV because “we get our periods at night”! “The idea of risk-taking is terrifying. I love Stephen Colbert, he’s a genius, but CBS [couldn’t] take the David Letterman slot and hire somebody who represented even an ounce of diversity? Also, when they got James Corden — another guy I love — there was this joke, “We’ve run out of white men here, we have to import them from England.” There is no shortage of established women who’ve been on the comedy circuit for years. It bums me out that someone like Kathy Griffin was relegated to Fashion Police,” said Lena about the current line-up. Let’s not forget that when Jon Stewart announced his retirement, there was plenty of speculation that female correspondents Jessica Williams or Samantha Bee would be good replacements. Instead they went with another male, albeit diverse, South African Trevor Noah. We should also point out that the super funny and talented Samantha Bee will be getting her own late night variety show on TBS, so that’s something to celebrate. Ellie Kemper says it’s about trying something new, which many networks are too scared to do. Pay disparity, which became even more apparent in the industry after the Sony leaks revealed startling gaps between what male and female stars were getting in certain blockbuster movies, is something each of these women have had to navigate in their own career, especially the higher position they get in. Amy Pascal, the former head of Sony Studios once commented on this issue saying that it’s up to women to negotiate, or not take the job if they aren’t being paid what they’re worth. But in a world where an actress has to decide between her dignity and paying her bills, it makes the issue far more complex than her black and white statement. “Sheryl Sandberg once asked me, ‘Do you know what you make compared to men who run an HBO show?’ and I was like, ‘Why would I ever ask about that? I can pay for dog food, and I have an apartment.’ I hear my boyfriend [musician Jack Antonoff] on the phone all the time saying, ‘I’m worth more than that.’ I do not have that skill,” said Lena in a startling admission that even women at the top have a tough time demanding what they are worth. “When it was leaked how much I was getting for my book [a reported $3.7 million for Not That Kind of Girl], there were 39,000 articles asking, ‘Is she worth it?’ Then it came out what Aziz Ansari was making on his book [a reported $3.5 million]. No one says a goddamn word,” she continued. “I once heard an exec say, ‘If you don’t ask for it, we can’t give it to you.’ We can’t go through our lives just being grateful for everything,” said Ellie. “I was raised by a woman [singer Diana Ross] who has high standards for what she’s worth, which has been called ‘diva behavior.’ I have witnessed flagrant, disgusting behavior, and that is not my mother. There is a way to be a woman, ask for what we deserve and be able to negotiate,” said Tracee pointing out yet another problem with women demanding what they’re worth, they are often labeled in a negative way. Hillary Clinton’s presidential run get brought up in the conversation, particularly because Kate McKinnon now plays her on Saturday Night Live, and the women reflect on how funny some of the conservative arguments against her are. “I love that people are like, ‘She’s not qualified to be president.’ Then everybody else they bring in, they’re like, ‘He managed a Ben & Jerry’s for a while’,” said Lena. We couldn’t have said it better ourselves! But enough about politics, we love that there is a new breed of comedians (who just happen to be female) showing the world that gender should not be an issue or deterrent, rather offer an enhanced and diverse perspective on the world that makes audiences, both men and women, laugh uncontrollably.